It became apparent at the midpoint of season two: With the revenants still in hiding and the living in various states of distress, it was suddenly very, very important to the characters of The Returned that they not be left alone. The sentiment is all over “Virgil”, and the notion of isolation as the ultimate level of hell only intensified as the final episodes rolled out. Milan got a watery form of solitary confinement. Julie found herself living by herself in an abandoned hospital wing. Victor had a nightmare of being alone on the seashore, his guardian angel tending to someone else. Pierre was the last living member of The Circle; The Circle’s actions left several children orphaned. Loneliness is the scariest monster under The Returned’s bed, and it’s also a fundamental component of the show’s grieving process. To survive is to be left alone. The characters can choose to be with others who’ve also been left behind (and often do), but not without first accepting that they’re on their own. And if you can embrace this aspect of the show’s vision, then you can accept the somewhat nonsensical explanation “Les Revenants” offers for why the dead have risen: Victor did it. Blessed with a second sight, but cursed with an inability to intervene, le petit garçon watched over the town from the Lewansky’s second story for 35 years. Until: Unforeseen calamity struck. When Mr. Lewansky collapsed in his home, Victor was there. We already knew that his hospitalization coincided with the strange occurrences within the town; “Les Revenants” reveals that the hospitalization was one of those strange occurrences. Fearing that he’d been left alone for good, Victor prayed that Mr. Lewansky would return—and he brought the spirits of all the town’s other unfortunates back with him. On the one hand: This big finale reveal weakens the mystique of the series. It offers concrete, conclusive evidence for why the dead came back to life, and robs the mass resurrection of far-reaching significance. If you’re watching The Returned from the “no answers, please” perspective, or taking a Pierre-like “answers, please—but they better be apocalyptic” view, this is pretty disappointing. You’ve been waiting two years to find out that this whole TV show happened because an immortal elementary schooler made a wish to save his adoptive father. But what “Les Revenants” reminded me of was the feeling I had when I first watched “Camille” in the fall of 2013, when The Returned looked like a more intimate rejoinder to other zombie apocalypse series, by way of “The Monkey’s Paw.” To know Victor caused all this undercuts some of the things I loved about that first season (which, full disclosure, I was much more enthusiastic about than this second season), but it also brings things full circle to the “Be careful what you wish for” vibe of the opening episodes. Think back to Sandrine in that very first scene at The Helping Hand, where Constance Dollé makes it seem like she’d give anything to see Audrey again. Then think about what Sandrine actually gave in order to be reunited with her daughter, in a tableau that comes as close as this show ever has to straight-up Night Of The Living Dead reenactment. Judging a whole series for the sins of its last episode is an unfortunate symptom of modern TV fandom; it wasn’t that long ago that a series finale was just another episode in a show’s run. I don’t know if “Les Revenants” will be the last hour of The Returned, but it certainly feels that way. What I do know is I’d hate to see the reputation of the show tarnished because some viewers object to the second season’s “that meddling kid” resolution. And I understand those objections! I even voiced them a few paragraphs ago! It’d be a shame for that to happen because “Les Revenants” isn’t all about that reveal, either. “Les Revenants” feels like a finale because it’s so good at putting a fine point on what had kind of become a big jumble of storylines throughout season two. It feels conclusive in all the right and most satisfying ways, delivering emotional blow after emotional blow, as characters either say farewell to one another or greet the next phase of their lives. For the revenants, that means an acceptance of being part of the crowd, as little clusters of the dead emerge throughout the crowd to claim their own. Though Camille must leave her family, she’ll never truly walk alone—as illustrated when the crowd parts to show her holding hands with Virgil. There’s tremendous power in physical contact in “Les Revenants,” be it that full-bodied embrace Julie gives to Victor when he finds her in the cell, or Lucy planting a kiss of gratitude on Alcide. Even something as simple as Adèle taking the hand of the cave-dwelling revenant packs a punch. There are plot mechanics that must be served in the finale, but it’s not at the expense of emotion. There’s such feeling present when the Segurets let go of Camille (all over again); foregoing the Segurets’ tears, Berg’s goodbye with Etienne is a marvelously understated echo of that scene in the woods. “I need you,” says the son. His father reaches out, touching Berg’s face with his right hand. “I don’t know who you are,” he replies. “You should forget me.” He won’t: Memory is how the revenants stay alive when they’re not revenants. Even some of the expository material reaps emotional rewards. When Camille checks the abrasion near her collarbone, it’s mentioned that the wound is caused by being away from other revenants. That explains what was happening to Audrey and Toni while they were in Helping Hand captivity; it also explains what’s going on with Serge near the end of “Les Revenants.” He won’t be joining the others in the woods—he’s chosen to stay in the tunnels and atone, a red badge of courage marking the consequences of his decision. 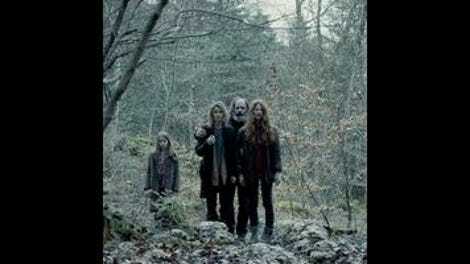 And even with the biggest question of the series answered, “Les Revenants” lets some mysteries be. Victor and Lucy are locked into some sort of yin-and-yang relationship, the true nature of which remains unclear. She arrived in town 36 years ago looking for him, and their scenes in the finale are charged with a grave understanding only they share. Swann Nambotin and Ana Girardot won’t be able to play ageless clairvoyants forever, but if a third season of The Returned comes to pass, I can see their characters still having some sort of connection to the story. After all, even in his seaside reverie with Julie and Ophélie, Victor can still sense Nathan, who, if Victor’s words to Julie are any indication, may one day perpetuate the cycle depicted in The Returned’s two seasons. Should that happen, “Les Revenants” makes it feel like Nathan would only do it by choice. That’s the real revelation of the finale: Not that Victor caused the return, but that he chose to cause it. He was always at the scene of a tragedy by choice, just as he chooses to change his and Julie’s fates, and just as the revenants choose to be with their own kind (or wither away on their own). Adèle chooses to trust Simon, and they’re both rewarded with the matrimonial moment they never got 10 years ago. Earlier in the episode, Etienne expresses regret for not choosing to listen to Victor’s warning about the dam; that regret resounds through his last words to Victor at the edge of the sinkhole: “If you want, you can change things.” This is the ending The Returned is giving us (for the time being, at least)—we can chose to not let it shatter our affection for a one-of-a-kind TV work.